Time to push back the tables and dance the night away. 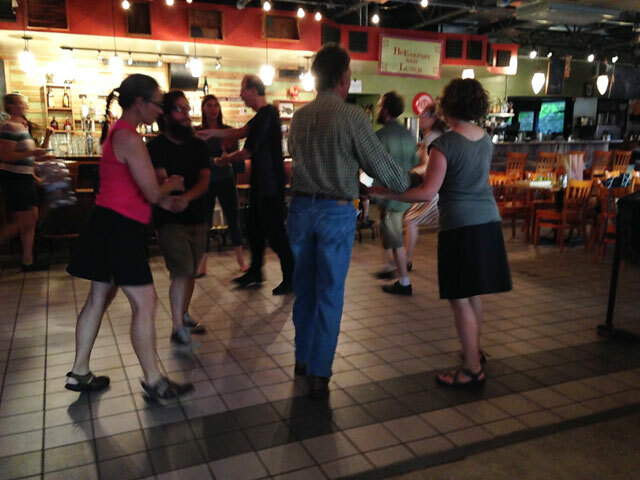 Daniel and friends have organized another Columbia Square Dance at Cafe Berlin on Thursday, August 28! So we don’t have to wait to dance again until the middle of September when our regular Fall Season starts! Grab a friend or two or three, put on your dancing shoes, and come on out to Cafe Berlin for some hot fiddle tunes and lively square dances. Music by Will Sherer and friends. Calling by Jim Thaxter, Daniel Kramer, Rhett Hartman, and possibly others. All dances will be taught and called. No experience and no partner needed. Refreshments available for purchase. Hope you can make it! It’ll be a lot of fun! This entry was posted in Square Dance and tagged cafe berlin, MMTD, old-time square dance. Bookmark the permalink.